An unusual synthesis instrument, Borderlands is a realtime audio granular-synthesis-approach application that utilizes samples (you have to provide your own for now, in .wav format) and your computer keyboard and mouse in order to create interesting timbres. 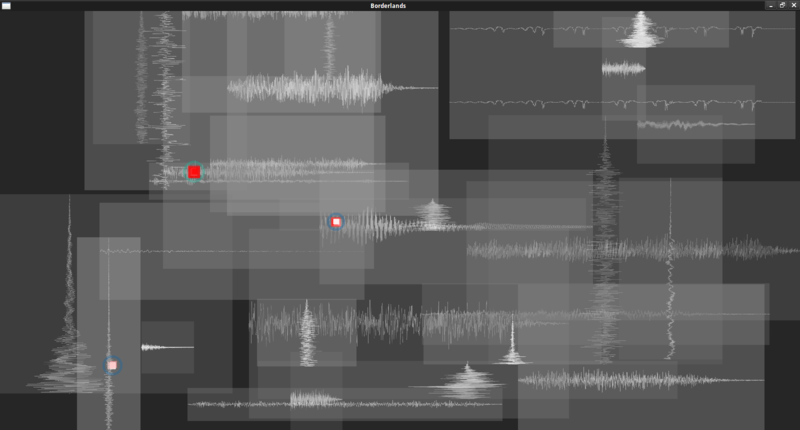 The screenshot above shows many different .wav samples I provided, and the red dots are the granular synthesis "clouds" that produce sound. Each cloud can be moved freely over the different audio samples (or vice versa), thereby creating rich and complex audio textures (audio demo above). The sampled wave boxes can be re-arranged and re-sized. Borderlands was created by Chris Carlson, and is available from the Standford University website (see link below). The website also includes a nice video demo in the Guide section. Most of the controls for this synthesizer are hotkeys at your computer console. After extracting the compressed package (linux version 0.4 shown in the screenshot above; see download page for details about compiling with qmake), this synth will produce sound once you have copied some of your own .wav samples to the dedicated "Loops" directory. Open a terminal within the source directory and type ./Borderlands to start the synth. It opens full screen, so toggle the "o" key to recall other running desktop items you may need. The included readme file is useful for learning to control the various parameters. Press "g" to create a new granular synthesis cloud. Dragging the cloud over the samples will also give volume intensity. Toggle "a" to mute or enable the cloud. X- and Y-axis control of the granular width of each cloud is another interesting feature provided.